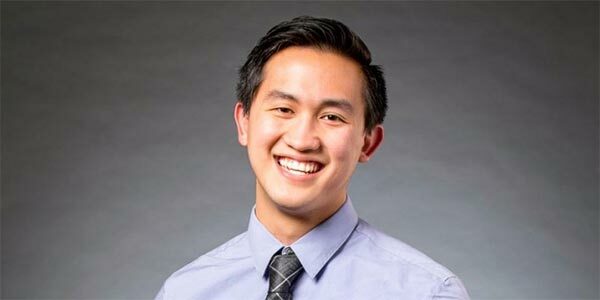 Caleb Perez, a senior in Robert F. Rushmer Professor Suzie Pun’s lab and member of UW’s Husky 100 Class of 2018, has received a 2018 Fulbright/Swiss Government Open Study/Research Award, and will work for a year at École Polytechnique Fédérale de Lausanne (EPFL) with Dr. Michele De Palma’s lab in the Swiss Institute for Experimental Cancer Research. He is one of 10 total recipients of 2018’s US/Swiss Fulbright awards, and among the 15 undergraduate and graduate students in this year’s UW Fulbright cohort. In Dr. Pun’s lab, Caleb investigates novel approaches for cancer immunotherapy. He focuses on engineered immune cells, or CAR T cells, which express a receptor that specifically targets cancer cells. In his project at EPFL, Caleb will pursue the development of dendritic cell vaccines, which present a promising direction for advancing immunotherapy’s potential. With his work, Caleb hopes to change the future of cancer treatment by opening doors to new therapies that improve patients’ quality of life and survival rates. Caleb is the third student in BioE’s history to receive a Fulbright Student Research/Study Award. BioE’s first Fulbright alumnus, Hani Mahmoud (B.S., ’14), collaborated with Kuwait’s Dasman Diabetes Institute on research and outreach aimed at improving children’s health. Sharon Newman (B.S., ’15) traveled to Europe to work with researchers in Switzerland, Germany and Italy to advance neuroprosthetic devices. The Fulbright Program was enacted in 1946 by US President Harry S. Truman as the flagship educational exchange program sponsored by the U.S. Government. The program provides grants for individually designed study/research projects or for English Teaching Assistant Programs during one academic year in a participating country outside the U.S. The Fulbright U.S. Student Program awards approximately 1,900 grants annually in all fields of study and operates in more than 140 countries across the world. Learn about the Fulbright Student Program. We recently caught up with Caleb to learn about his work, and how an early introduction to science in his home state of Hawaii drove his interest in bioengineering and translational research. He offers his perspective on what BioE has to offer students interested in research that addresses clinical challenges, and advice for them to take the next step forward towards making an impact. What inspired this project? How is it related to your work in the Pun lab? My work in the Pun lab focuses on improving CAR T cells, which are immune cells that are genetically engineered to express a receptor that specifically targets cancer cells. My project in the De Palma lab follows a similar strategy, but the cancer-specific receptor is engineered into dendritic cells, which then present tumor antigens to T cells in the body to prime an anti-tumor response. Tell us how you got involved with Michele De Palma’s lab, and what made you decide to continue the project with your Fulbright grant? I initially got involved with the De Palma lab through a summer internship program run by the EPFL. Every year, they fly out a small group of students from around the world for research internships, and they paired me with Dr. De Palma based on my interests in translational research. This experience served as my introduction to cancer immunotherapy, which ended up having a huge impact on my research interests. I was blown away by the therapeutic potential of engineering the immune system, and I wanted to do more work in this area. My internship at the EPFL was what actually motivated me to switch into the Pun lab and pursue immunotherapy research, and my interest in the field has only grown since then. With that in mind, it was an easy decision to apply for Fulbright to return to the project that started it all for me. What are your hopes for this project to advance discovery in your field of research, and to improve health care and peoples’ lives? With CAR T cells revolutionizing the future of cancer therapeutics, immunotherapies comprise a booming area of research and have the potential to save lives. They have cured late-stage cancer patients who were previously deemed untreatable. If our cancer vaccine pans out, incredible therapeutic impact is possible. The system that we are investigating has two major strengths that could make this possibility a reality. First, the vaccine uses genetically engineered dendritic cells (DCs), which are responsible for presenting the tumor antigens to effector immune cells to elicit the anti-tumor response. This could have wider therapeutic effects than the immediate action of the CAR T cells. DCs could activate multiple branches of the immune system in addition to T cells, such as the antibody production of B cells. Second, the engineered receptor is designed to increase the uptake of exosomes released by the tumors, which contain a plethora of potential tumor-associated antigens (TAAs) that could elicit the immune response. Therefore, it is not necessary to identify a single specific TAA to make this therapy work, as is necessary with CAR T cells. In addition, this also opens up possibilities for neoantigen discovery to use in other immunotherapies. What’s next after your Fulbright? After my year of research abroad, I’ll be returning to the U.S. to begin graduate school. I have deferred an offer of admission to MIT’s biological engineering program to the fall of 2019. I chose MIT because of their strong focus on cancer immunotherapies — the Koch Institute for Integrative Cancer Research at MIT is full of a number of incredible faculty members in this field and I’m excited to join that community. Tell us about your background before you arrived at UW. I was born and raised in Hawaii, in the city of Kapolei on the island of Oahu. I am the youngest of three kids, with my older brother and sister leaving for college when I was fairly young. My siblings were role models for me — I always wanted to leave Hawaii for a big college on the “mainland,” as we call it, just like them. With that in mind, I graduated from Kapolei High School in 2014, and then headed to UW. What got you interested in science, and in bioengineering specifically? When I was in high school, I participated in a program called STEP-UP, which is an NIH-funded program that provides research internship opportunities to underrepresented minorities. This ended up being an incredible introduction to research and was the starting point of my interest in the field. I worked in a virology lab at a medical school in Hawaii, where I investigated different mutants of the West Nile virus that had been engineered as potential anti-viral drugs. I thought the possibility to impact health through engineering was really cool, so I pursued bioengineering. I knew I wanted to get out of Hawaii, as there just aren’t that many STEM job opportunities there. I thought UW offered strong research opportunities and the booming biotech industry in the Seattle area provided career options. Coming from the small island lifestyle I experienced in Hawaii, I was excited to live in a big city like Seattle. I was also happy that I wouldn’t be leaving too much beautiful nature behind when coming to the Pacific Northwest. But nothing will ever convince me to get in the water here; I’ve been far too spoiled by Hawaiian beaches. There are so many majors at UW where students pursue research with bioengineering-related applications. Why did you choose BioE? With my interest in research, the emphasis that BioE places on undergraduate research was a big draw. The faculty in BioE do some incredible work that I wanted to be a part of, so it was an easy choice. How did BioE enable your success as a student? I’ve found the best part of my experience in the BioE program to be the cohort system. Getting to know this group of awesome people has been amazing, and having that built-in support system of people that you know are going through the exact same struggles as you was immeasurably helpful in getting through all of it. From a career prospective, the connections I’ve made in my cohort also presents a huge number of future collaborators too! Have you participated in any activities or student groups outside your work in BioE? What impact have they had on your experience at UW? I have done a lot of work with Bioengineers without Borders (BwB), a student organization that develops low-cost medical tools for the developing world. It has been a really cool experience to apply what I’m learning as a bioengineer to a great cause, and I have enjoyed building up our project from the ground up. Our team actually just won funding through an Amazon Catalyst grant, which was an amazing culmination of my time with BwB. I’m excited to see how the future BwB members move our project forward. Would you recommend UW, and BioE specifically, to prospective students? If yes, why, and do you have any advice for them? I would definitely recommend BioE to any prospective students interested in research, as I think this is the best place to pursue research at UW. My main piece of advice for younger students interested in research is to pursue as many summer internships as possible. In my opinion, internships are excellent ways of exploring different fields and areas of research that are low pressure and low risk. They are how I honed my interests, and I’m not sure I’d have any idea what I wanted to do without them.